Darwin is the capital of Australia’s Northern Territory and the gateway to the various national parks in the Top End. 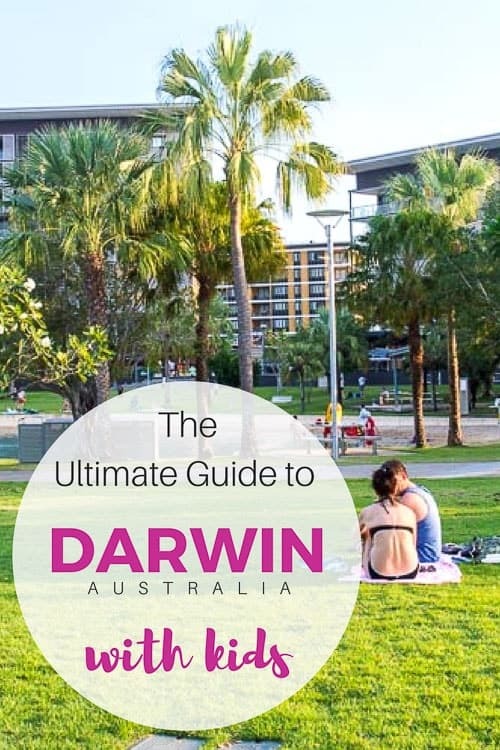 If you are wondering what to do in Darwin, there are numerous Darwin attractions within the city centre, as well some great national parks which can easily be visited during a day trip or via one of the several Darwin tours. Many people, including us, spend a few days in Darwin before commencing one of the Northern Territory tours. Tours like Darwin to Uluru, or top end tours such as Kakadu National Park Tours and Litchfield National Park Tours all commence from Darwin. So it’s a great opportunity to spend a few days in Darwin either before or after your tour and explore the city. 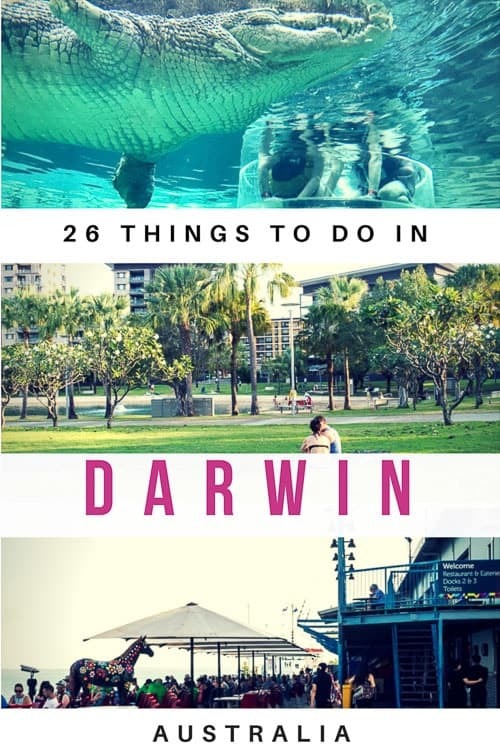 In this post, I will share with you all the top things to see in Darwin, including the best Darwin tourist attractions, how to best to reach them and details of entry fees. Are you headed to Alice Springs? 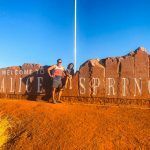 Check out our post on things to do in Alice Springs and the best budget Alice Springs Accommodation. 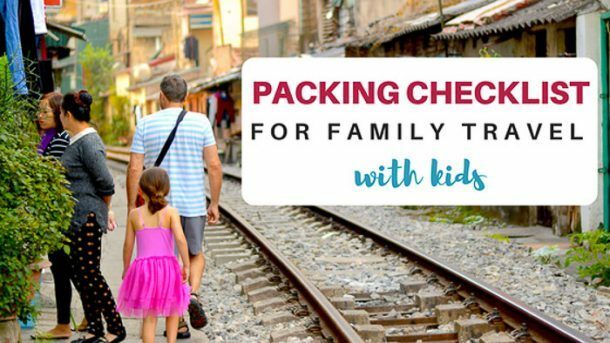 1.10 Download our FREE Printable Packing Checklist!! 1.11 We will email you a link to your FREE packing checklist. 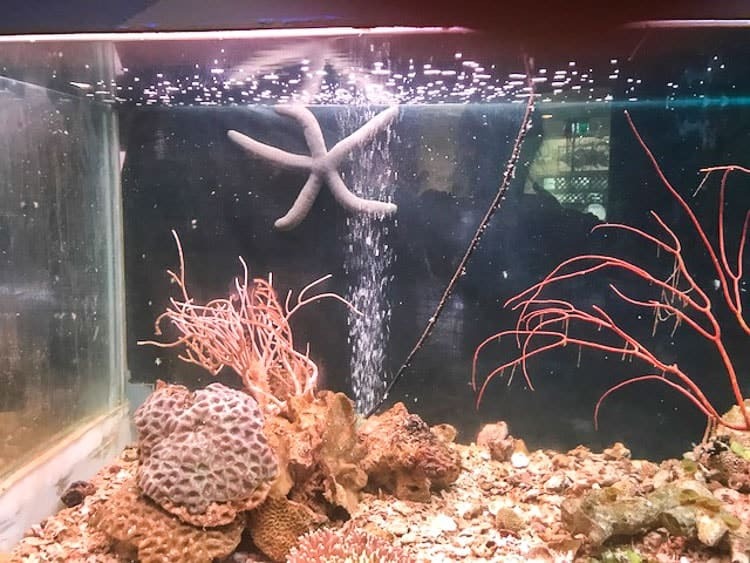 If you’re looking for top things to do in Darwin for kids, then take the kids down to Aquascene to hand feed the hundreds of fish that come ashore daily during high tide. This is a unique experience with a massive quantity of fish of all shapes, colours and sizes interacting with one another. As you feed the fish, local guides provide information about the various fish species, which include catfish, rays, cod, mullet, milkfish, bream, barramundi, diamond fish, parrot fish and the occasional giant grouper. You can feed the fish from the concrete stairs or wade into the waters having the fish touch you as they take the bread directly from your hands. Aquascene is located on Darwin’s Esplanade and fish feeding only happens during high tide so be sure to check the feeding times in advance. Tickets cost $15 per adult and $10 for kids and includes stacks of fish food once inside. Driving to Broome? Check out this Darwin to Broome itinerary. 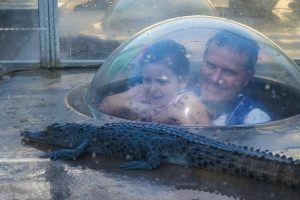 One of the best things to do in Darwin would have to be checking out the crocs at the Crocosaurus Cove. 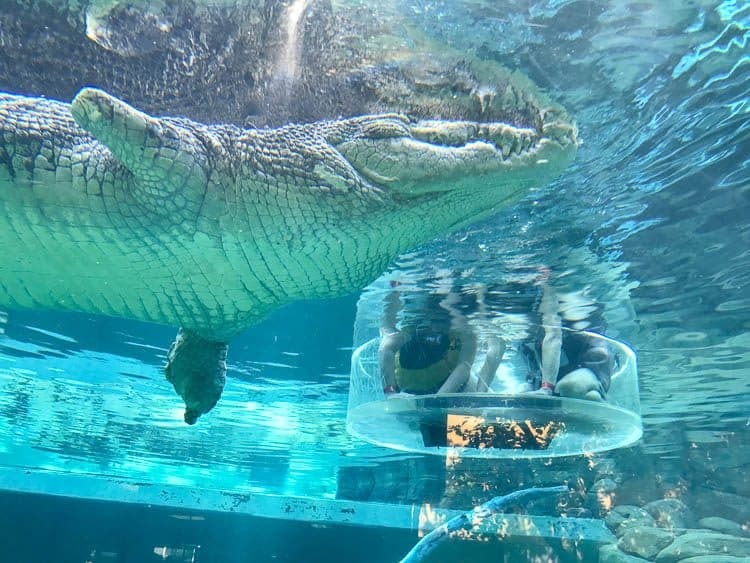 Located in the heart of the Darwin CBD, the Crocosaurus Cove allows visitors to view some of Australia’s largest salt water crocodiles from purposely designed displays that can be viewed from all 3 levels. Whilst most wildlife parks allow you to view crocodiles at eye level or from above, what I absolutely loved about Crocosaurus Cove was the ability to watch the crocodiles from beneath. I was in complete awe watching these massive giants – like Axel who is over 5.1 metres long and weighs over 900kgs! If you’re super brave you can take part in the Cage of Death. The Cage of Death involves visitors getting into a glass cylinder which is a lowered into the crocodile enclosure for 15 minutes where you can get super close to crocodiles in a safe environment. If this isn’t your thing (it isn’t mine!) then it is awesome to watch others from below go into the water with the crocodiles. I also loved the set up with the baby crocodiles. There are these little bubbles on the ground in their enclosure where you could put your head into and get centimetres away from the crocodiles. Other animals on display include turtles, fish and reptiles. There are also various shows on during the day including crocodile feeding, fish feeding and reptiles. We watched all shows and of course the highlight was watching the big crocs get fed. A lot of thought has clearly gone into the Crocosaurus Cove in that it really allows you to view the animals on display from a variety of perspectives and at a very close range. Given its convenient location in the centre of Darwin, I would highly recommend a visit during your stay in Darwin. Crocosaurus Cove is open daily from 9 am to 6pm and tickets are $35 for adults and $23 for kids. The Cage of Death is extra. You can book online here for general admissions or here for the Cage of Death. 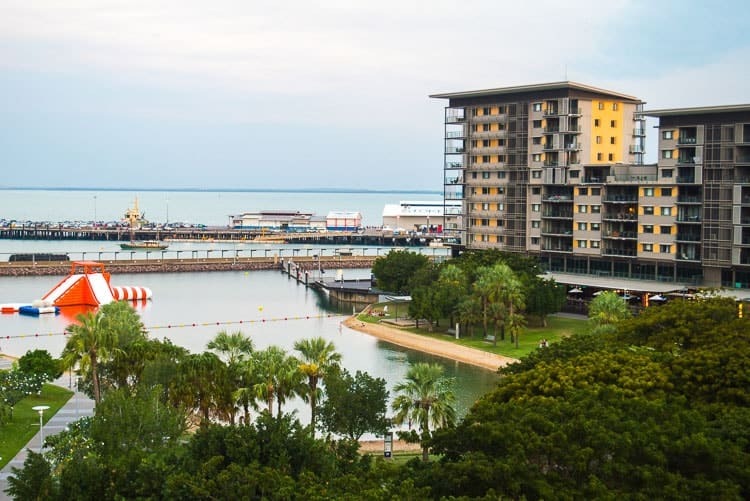 Located just next to the Darwin CBD is Darwin’s waterfront precinct where you will find a variety of outdoor restaurants, cafes, bars and various tourist attractions as well as lovely grass areas to relax. 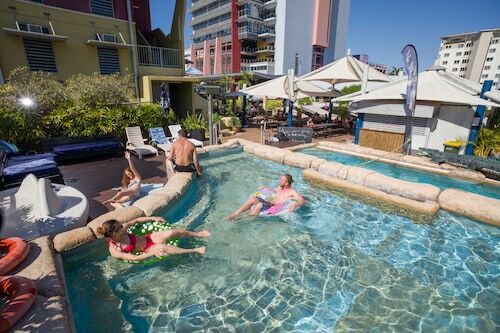 The Waterfront is home to Darwin attractions such as the Wave Pool and safe swimming Recreation Lagoon. If you are looking for free Darwin tourist attractions then take the family down to the recreation lagoon. The recreation lagoon is perfect for swimming and other water based activities. Stinger nets and life guards keep swimmer’s safe. The recreation lagoon is located on Darwin’s waterfront and entry to the recreation lagoon is free. 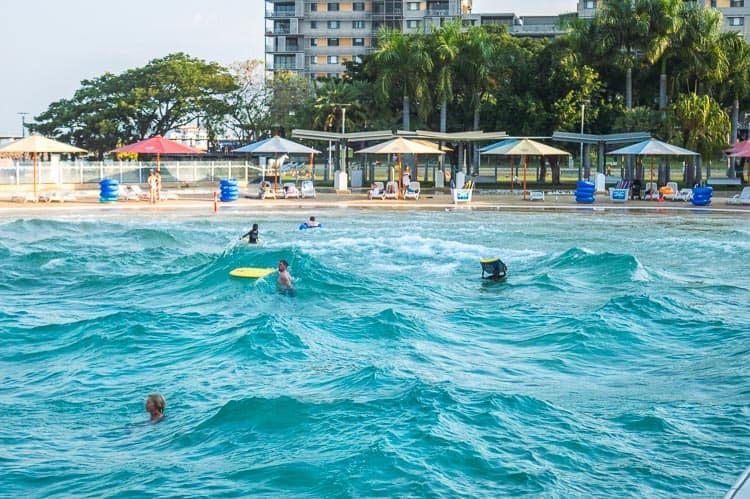 Located in the Recreation Lagoon on Darwin’s waterfront, the Big Buoy Water Park is an inflatable water park – basically big bouncy castle things in the water! 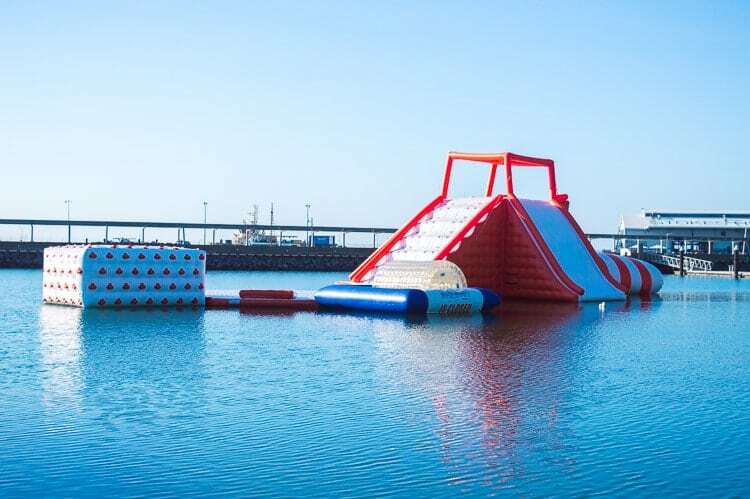 Anyone from 6 years of age can join in, with activities including climbing cubes, slides and jumping pillows. The park is open between the hours of 10 am and 6 pm and entry is $15 per person per hour. The Wave Pool is a man-made lagoon style swimming pool which is perfect for swimming, tube riding and relaxing. Each 20 minutes the calm lagoon turns into a wave pool with waves up to 1.7 metres. There is plenty of space for lying about on sun loungers or the lawn. There is also wading pools and fountains for the little kids and a kiosk to purchase food and drinks. Whilst we didn’t go into the wave pool we did watch for a bit from outside and those waves looked fierce! However, the pool is patrolled by life guards. The wave pool is open daily from 10 am to 6 pm and tickets are $7 per adult and $5 per child, with under 3’s free. Family passes are $18 which cover 2 adults and up to 3 kids. Also located on Darwin’s waterfront is the historic Stokes Hill Wharf. The wharf is home to a variety of seaside eateries and is the departure location for various cruises on Darwin Harbour. I highly recommend a walk out to the wharf and have a meal or an ice cream. At Stokes Hill Wharf, you will also find the Bombing of Darwin tourist attraction & Royal Flying Doctor Service Darwin Tourist Facility. Both Darwin attractions educate visitors via virtual reality and holographic experiences. The tour starts with two short films; one detailing the bombing of Darwin and one about the Royal Flying Doctor Service. My favourite thing at the museum is without a doubt the virtual reality experience which puts you on a ship as the bombs goes off around in the Darwin Harbour. The experience is so real, it is a fantastic way to learn about the historical tragedy. The attraction is open 7 days between 9.30 am to 6 pm and tickets are $26 per adult and $14 per child. Various harbour cruises leave from the Stokes Hill Wharf to see the wildlife both above and below the water. The sunset cruises are particularly popular where passengers can enjoy seafood buffets whilst watching spectacular sunsets across the harbour. We didn’t go on any cruises during our time in Darwin, but we saw a view boats heading out at sunset and they looked amazing. Some of the boats appear more casual serving fish and chips on picnic like benches, whilst other boats are more luxurious with individual set tables serving Champagne as passengers boarded. You can check out and book your harbour cruises here. Located between Stokes Wharf and the waterfront precinct, the Indo Pacific Marine houses one of the 3 living coral reef exhibitions in the world. 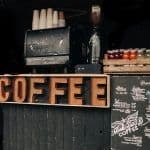 If you happen to be in town on a Thursday or Sunday evening between April and October then be sure to head down to the Mindil Beach Sunset Markets. 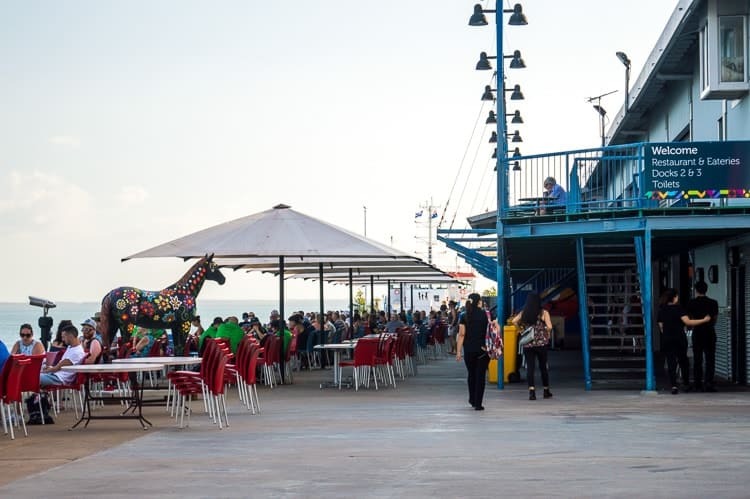 Here you will find delicious international food, arts, crafts and heaps of street entertainment all with the backdrop of the tropical Mindil beach. Try food from a variety of countries such as Turkey, Greece, Sri Lanka, South America, North Africa, India and all over South East Asia. Whilst enjoying entertainment from live street theatre, magicians and local and international buskers. Make sure you get there in time to watch the sunset, this is a fantastic spot to watch one of Darwin’s spectacular sunsets. The Mindil Markets are on between the months of April and October between the hours of 4 pm to 9 pm. 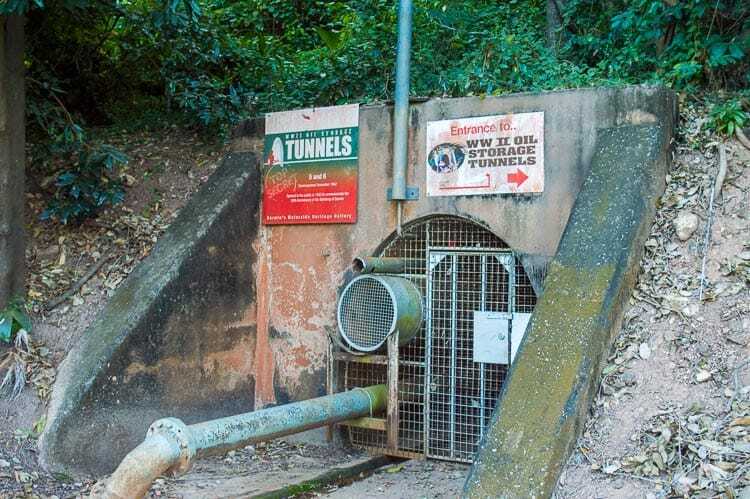 Located on the Darwin waterfront, visitors can go into the tunnels and learn how they were built following the bombing of the oil storage tanks during WWII. There are various displays which provide information during your self-guided tour. The tunnels are open daily and entry cost $8 for adults and $5 per child with under 4s being free. Located in East Point about 15 minutes’ drive from the Darwin CBD is the Darwin Military Museum and Defence of Darwin Experience. These Darwin attractions detail Darwin’s role in World War II through objects from the bombing of Darwin, firsthand accounts and multimedia presentations. The museum utilises the stories of actual people involved in the conflict to add a human element. As the museum is out of the CBD you will need to get a taxi there if you don’t have your own transport. Expect to pay around $25 each way. Expect to spend 2- 3 hours at the museum. The museum is open daily from 9.30 am to 5 pm and entry is $18 per adult and $8 per child with under 5s free. Along the Esplanade is the Deckchair Cinema – an open-air cinema screening popular movies. Seating in low back deck chairs is provided as well as extra cushions for extra comfort. Families can purchase food and drinks at the onsite bar and various food stalls or bring their own picnic. Don’t forget the insect repellent! I got bitten just walking around the Darwin CBD. Tickets can be purchased online. Adult tickets are $16 and kids are $8. Family passes are available for $35 which include 2 adults and 2 kids. The cinema is only open during the dry season which is between April and November, when it operates every night with movies starting at 7.30 pm. Located 15 minutes out of the Darwin CBD is Crocodylus Park where visitors get yet another opportunity to see the famous Australian salt water crocodiles. The park is home to over a thousand crocodiles, of various sizes and ages. A great way to the see the crocodiles is via the boat cruise which navigates its way through the man-made lagoon. During the cruise, you will see a variety of flora and fauna with educational commentary. Crocodile feeding tours are also held daily at a variety of times. The park is also home to a variety of other wildlife including tigers, lions, monkeys, birds, kangaroos and other reptiles. The park is open daily from 9 am to 5pm and tickets for adults are $40 and kids are $20 with under 3s free. Bombing of Darwin WWII Heritage Tours is a 4-hour tour of the visible relics left behind after the Japanese bombing of Darwin during World War II. During this time, in 1942, Darwin was devastated and Australia seriously threatened. The Bombing of Darwin WWII Heritage Tours operates daily during the months of April through to November. Bookings can be made online here. 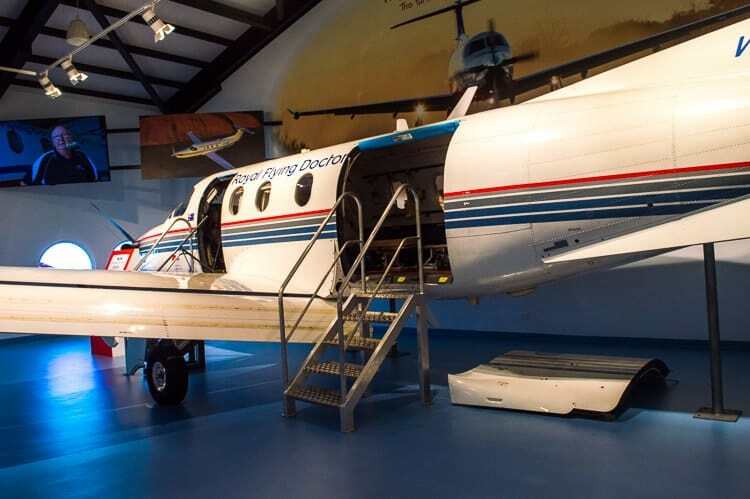 Just outside the Darwin CBD is the Australian Aviation Heritage Centre where visitors can see dozens of aircrafts, engines and plane crash remnants. This is a massive museum and details various historical events such as the 1942 bombing of Darwin and various other air battles of World War II. Aircrafts on display include the massive B-52 bomber, Spitfires and Tiger Moth biplanes and many more. The centre is only daily from 9 am to 5 pm and tickets are $15 for adults and $7 for kids. You can book tickets online here. If you don’t have your own transport, you can catch a bus or go by taxi. Located just outside Darwin’s CBD, the Museum and Art gallery of the Northern Territory (MAGNT) has a variety of displays featuring the region’s art, history and culture. MAGNT is open daily and entry is free. Located a short drive out of the CBD or a 30-minute walk is the George Brown Darwin Botanic Gardens. The gardens have a wide range of environments and flora of northern Australia, including 450 species of palms and plantings from Tiwi Island and Arnhem Land. The gardens are open daily and entry is free. Approximately 20 kilometres out of the CBD is the Palmerston Water Park. The best part is entry is completely free!! The park includes 2 different wet areas suitable for children of all ages complete with water sprays, curtains and tipping buckets, a wading pool, a six-lane racer water slide, skate park, picnic areas and a café. The park is open daily between the hours of 9 am to 8 pm, however the wet areas are only open between the hours of 10 am to 6 pm and the water slide has various hours –check here for the time. Take a tour to the Tiwi Islands to see a variety of birds, explore dense rainforests, sandy beaches and rock pools. Bird watchers will love seeing the wide variety of bird life including crested terns, the endangered Tiwi Hooded Robin, Red-necked Stint and Bar-tailed Godwit. Offshore marine life includes whales, dolphins, dugongs, turtles and more than fifty species of fish. The Tiwi Islands are famous for Aboriginal arts and crafts, so ensure your trip to the islands includes a stop at an art centre where you can see artists at work and purchase local art and craft. To access Tiwi Islands you will need to join one of the Darwin day tours where you can access the island via light aircraft or ferry. You can book online here. The Fogg Dam Conservation Reserve is only 45-minute drive from Darwin and is one of the few wetlands in the Northern Territory that can be visited all year round. Boardwalks take you through the different landscapes to observation platforms to view over 200 species of birds and other wildlife including crocodiles, rats, turtles and pythons. The park is only daily and entry is free. The Territory Wildlife Park is located 40 minutes’ drive from Darwin close to the Berry Springs Nature Park (see below) and so makes a great day trip. The Park is divided into 3 different habitats being the wetlands, monsoon vine forest and the woodlands. Each distinct habitat showcases numerous animals in a variety of habitats. There is also a great birds of prey presentation featuring some of the Northern Territories best birds of prey. The park is open daily and entry costs $32 per adult and $16 per child with under 5s free. Corroboree Billabong is part of the Mary River Wetlands and home to the largest concentration of saltwater crocodiles in the world. Join one of the various boat cruises in the region to see and learn about the local wildlife including crocodiles and wetland birds such as jabirus, brolgas, magpies and geese. Cruises start at adults $40 and child $30 1 – 1.5, 2, 2.5 – some tours include lunch. Corroboree Billabong is located approximately 90 minutes’ drive from Darwin, so can easily be visited on a day trip or a great stop over on your way to Kakadu. Visitors can also stop at the Window on the Wetlands information Centre which has a variety of interactive displays explaining the wetlands and has a great view of the Adelaide River floodplains from the upper viewing deck. Located 47 kilometres from Darwin, the Berry Springs Nature Park is an ideal day trip. The park has a variety of shady areas with tables and BBQ facilities, bushwalking tracks and fresh water pools. The area was used as a recreation camp for the armed forces during the war and many of their huts were built at Berry Springs and the remains can still be seen around the main pools. There is also a display centre where you can learn more about the history of the area during the war. The park is open between 8 am and 6.30 pm and entry is free. 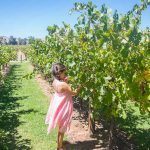 Being only an hour’s drive from Darin, the region of Adelaide River is a great day trip offering a variety of historical war sites; home to the famous salt water crocodiles as well as croc free swimming holes. 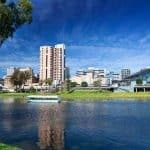 Here are some tourist attractions to visit in Adelaide River. There are several cruise operators that take travelers out to see crocodiles in their natural habitat. The Adelaide River is home to over 1600 crocodiles and during the cruises, the guides showcase a range of different sized crocodiles as they dangle some food over the river and the crocodiles leap spectacularly in the air. Adelaide River jumping crocs cruises depart daily at various times across the day and prices start at $40 for adults and $25 for kids with under 4s free. 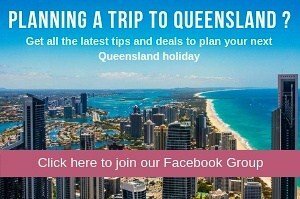 Book online for the jumping crocodile cruise with transportation from Darwin and various other stops here. For war buffs, stop in at the Pell Airstrip to hear the stories of the rescue and repair Service Unit of World War II. The World War II Heritage and Historic site is located just 10km North of the Adelaide River township. Tours are part driving and part walking and includes the Pell wartime Airstrip that was used to bring aircraft within the camp, stand on the parade ground and see the remnants of multiple workshop stations where over 556 men lived and worked. Tours take place twice daily and cost $60 per person, including morning or afternoon tea. Visit the first main station complex on the North Australia Railway from Darwin and Pine Creek. 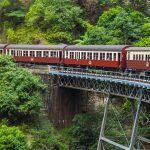 The railway played an important role during World War II as an important military centre, with the main hospital situated north of the township along with many Australian and Allied bases in the area. The station is open daily between 9 am and 4 pm and entry is free. At the Adelaide River War Cemetery, you will be reminded of the devastating impact of World War II on the Territory by visiting military graves and honouring civilians killed. There are 434 military burials and 63 civilian burials. The Adelaide River War Cemetery is open daily and entry is free. Robin Falls is a gorgeous waterfall located just outside Litchfield National Park near the township of Adelaide River. You can access the falls via a short walk following a crystal-clear creek through scenic bushlands. Bring your swimmers as you can take a dip in the waterfall. Robin Falls is only accessible during the dry season and entry is free. It is recommended that you spend a few days in the below places. However if you don’t have the time you can do day tours. Click on the link below for more information. For a full list of tours available from Darwin, click here. Road tripping it to Alice Springs? Click here for some tips. There are two seasons in Darwin – dry and wet. Despite having two distinct season, temperatures are fairly similar year round ranging from the low 20’s to low 30’s. The difference is the humidity. During the dry season the humidity is relativity low, making the climate very comfortable, whilst in the wet season the humidity can be extremely high making it hot and sticky. The dry season is from May to October and is the most popular time for tourists to visit Darwin. It can get a bit cooler during the months of May to July with temperatures during the evenings getting down to around 17 c.
The wet season is from November to April and brings monsoonal rain – but the rain is not continuous and the average storm lasts no more than 20 to 60 minutes, making the wet season still a great time for tourists to visit. During October to December there are often storms with spectacular lighting shows, which are fantastic to watch from the safety of the beach side restaurants and bars. You can easily get around Darwin’s city centre and its attractions by foot. However, if you want to visit attractions out of town you will need to have your own car, join a tour or grab a taxi. You can also use the hop on hop off bus – click here to purchase tickets. 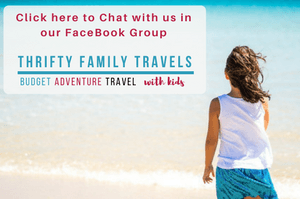 Wondering where to stay in Darwin with kids and on a budget? We stayed at 2 different places and recommend both. See below for further details. Located in the heart of the Darwin city centre, the Value Inn offers family great budget accommodation. Rooms are small and basic but provide everything you need for a place to sleep. We spent 1 night here and found it to be a great location and fine for families just after a room, although unfortunately rooms only accommodate up to 3 people. Our room included a double bed and a single bed, with a small fridge, tea and coffee making facilities and a TV. There is off street parking available too if you have a car with you. These rooms are tiny though and won’t accommodate stacks of luggage. The hotel also has a small pool or you can use the pools next door at the Melaleuca on Mitchell one of the Darwin backpackers. The hotel has pretty good reviews on TripAdvisor which you can read here. At the time of publishing the best rate was on Expedia for $60 per night for 3 people. Click here for the current rate and availability for the Value Inn. Located right next door to the Value Inn and in the heart of the city, whilst ultimately a Darwin backpackers, the Melaleuca offers families great budget accommodation. Private family rooms include a double bed and bunk beds. The room contains no TV or fridge but the room is quite spacious. 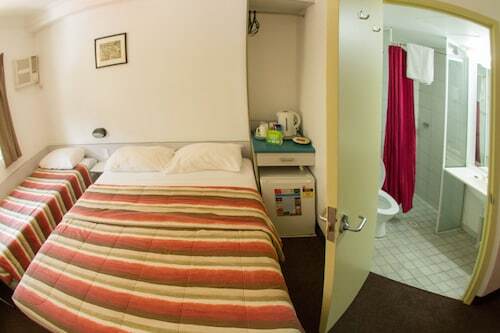 The good thing about the Melaleuca is that it has all the conveniences of a backpackers such as laundry and kitchen. There is also a bar and pool. We stayed here for 1 night and found the room spacious and to be honest better than the Value Inn next door. It was great to be able to do some laundry and have a few cheap drinks at the bar whilst waiting for our clothes to wash and dry. There is off street parking available too if you have a car with you. The hotel has reasonable reviews on TripAdvisor which you can read here. At the time of publishing the best rate was on Booking.com for $105 per night for 4 people. Click here for the current rate and availability for the Melaleuca on Mitchell. We really loved Darwin, it’s a lovely quiet town with some beautiful areas in the city centre for recreation and relaxing. 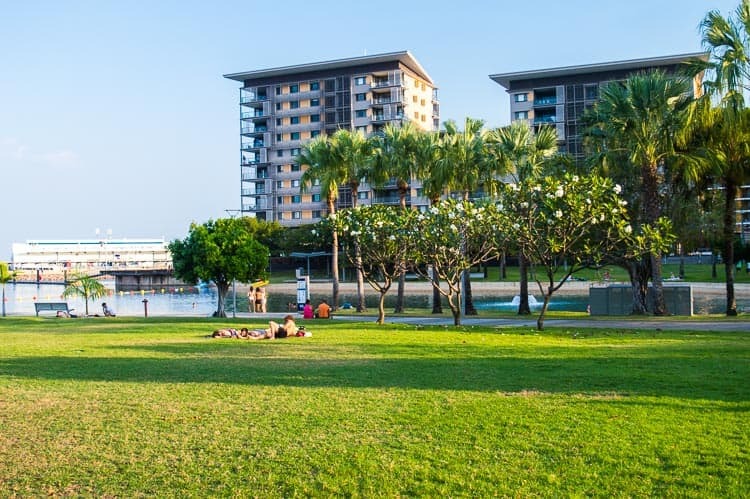 We just loved sitting on the grassy areas in Darwin’s Waterfront area watching the world go by. One thing to be warned about, Darwin is expensive! That goes for food and accommodation. If you are on a tight budget you really can’t go beat the Darwin Backpackers mentioned above. This area is also where you will find the cheapest food – but expect prices to be high! We only spent 1 full day in Darwin before the commencement of our Darwin to Uluru trip but could have easily spend at least 1 more day. 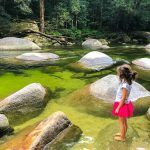 If you are not planning on staying in any of the nearby National Parks, I would spend at least a week in Darwin to allow time to see the various attractions outside the city centre. Thanks to Crocosaurus Cove for hosting our visit. Please note that the above post contains affiliate links, which means if you book through an of the above links I will receive a small commission at no extra cost to you. Thanks for supporting our website. Want to save this for later? Click on the one of the images below and pin to Pinterest.